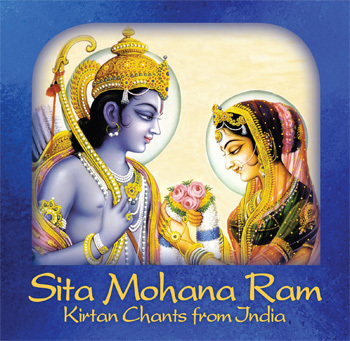 Just as Ram is the enchanter—mohana—of Sita, these chants to Sita-Ram, Krishna-Radha, Ganesh, Shiva and Maa express the sweet enchantment of God’s love. Rama was the very soul of Sita. If you pray to Lord Rama, really believing in his/Sita’s Shakti, you will feel that purity reigns. Sri Rama, an incarnation of Vishnu who lived in India 7500 years ago, is the embodiment of compassion, love, wisdom and dharma—righteousness. These joyful chants were originally recorded live during the Satsangs of Swami Amar Jyoti at Jyoti Mandir (Temple of Light) at Sacred Mountain Ashram and Desert Ashram. Sung in Hindi, the chants include solo and layered vocals accompanied on guitar, synthesizer, tabla, violin, tamboura and percussions. For decades we have chanted these chants to Sita-Ram, Hanuman, Krishna-Narayan, Devi Maa, Shiva and Ganesha and invite you to join us and dive deep in the bliss of the Lord’s Name!